"The way that we fight back is to show that we are not weak, we are not driven by PR, we are a party of principle. There's only one way they can go, which is the traditional Conservative way, the right policies, the progressive policies of successful countries around the world of low taxation, deregulation, strong immigration controls, strong defence and building on the social responsibility theme of David Cameron. The fact is that traditional policies of all successful Conservative governments since the Second World War have all been much the same." "It is a moment of crisis, or at least a critical moment, in that it is very important that David Cameron should see off the people who want to undermine the strategy to position the Conservative Party on the centre ground. Many people like what David Cameron is doing, but they are not convinced that the party is following him... David Cameron has to take the party to the centre. It is possible it is not do-able, but he should certainly die in the attempt." Michael Gove denied that the Party was in crisis but agreed that the election would be won "by sticking to the centre ground". He said Brown wasn't underestimated and that his poll lead is a blip similar to that enjoyed by Eden, Callaghan and Major. As warned yesterday evening, two opinion polls this morning will put a smile on Gordon Brown's face. An ICM poll for The Guardian* gives Labour a 4% lead and YouGov for The Daily Telegraph* puts the Labour lead at 3%. Brown enjoys a 35% to 23% advantage over Cameron on who would be the best PM - this contrasts with a 30% to 25% advantage for Cameron in April. Labour is back in the lead on economic competence; 35% to 27%. By 52% to 37% voters believe that it is possible for Labour to enjoy a fresh start under Brown. 43% are optimistic in some way about Brown as PM but 49% are not optimistic in any way. By 48% to 25% voters think Brown is an asset to Labour. By 37% to 28% voters think the 'new' Cabinet looks much the same as the old one. Fieldwork for the ICM survey began after Brown became PM on Wednesday and was finished on Thursday night. The Telegraph says simply that their YouGov survey was only undertaken after Brown became PM. It is possible that these polls will only have captured some of the early honeymoon effect, therefore. Yesterday's newspapers were, for example, very positive about Brown's Cabinet. "In Wednesday's speech, which was overshadowed by Mr Brown's coronation as Prime Minister, Mr Cameron said he believed in "the politics of and" rather than of "or". 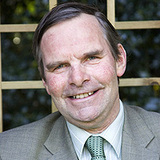 The party leader, according to Conservativehome.com, delighted some shadow Cabinet members, when he said they would be "committed to protecting the environment and would be a party of free enterprise; a party that was tough on crime and its causes - particularly family breakdown; a party that would campaign for a referendum on the EU treaty and would prioritise international development"." * The changes shown in the graphic above are different from those reported in The Guardian and Telegraph. That is because ConservativeHome compares with the most recent polls by ICM/ YouGov for any media organisation rather than for the most recent poll for that particular media organisation. 8pm update: The YouGov/ Telegraph survey gives Labour a 38% to 35% advantage and Brown a 12% advantage over Cameron on best Prime Minister. A poll published in today's Economist but taken before Gordon Brown entered Number 10 (click on graphic to enlarge for details) gives Cameron relative advantages on tax, the EU, improving schools, improving the NHS and reducing immigration. There's nothing much to choose between the two leaders on climate change and Gordon Brown enjoys a solid advantage on strengthening the economy. UK Polling Report has commentary here. A Populus poll for today's Daily Politics programme on BBC1 (that was conducted at the start of this month) found that 48% agreed that Mr Cameron was "superficial and lacks any clear convictions". 40% disagreed. 36% said Mr Cameron had the "strength and judgment to be a good prime minister". 49% said he did not. 54% agreed that it was "no longer clear what the Conservative Party stands for". 36% disagreed. Thanks for your reply to my opening post of yesterday. Because I agreed with just about everything you wrote and in the light of today's aborted bomb attack I thought we should shift our exchange to how the Tories should respond to Brown on homeland security and - furthermore - how the Tories can show some leadership on this issue. My own belief is that it won't be too long before one or more of these attacks are successful. Security issues will then rocket up the agenda and we know that this could help Brown. I don't think voters will blame our new PM for attacks in the same way many voters mistakenly blamed Blair and his Iraq policy for 7/7. Even when Brown was in the opinion poll doldrums a few months back he led on security issues. The Tories are probably right to say that this incompetent Labour government won't get ID cards to work and that the expenditure would be better spent on "community policing, more prison places, drug rehab services and a proper border police force" (as David Cameron wrote in yesterday's Sun). The message that always seems to come over most loudly, however, is our opposition to security measures that Labour propose rather than our own ideas. I think we need a big hitter who is in charge of our security message and that person should certainly sit in the shadow cabinet. David Cameron has waited too long to replace Patrick Mercer and when he reshuffles next week I wonder if he could persuade Baron Trimble or Lord Stevens* to be the Tory spokesman on this issue? Both could help the Tories get back in the game on this topic. What do you think? That person could then take the lead in exposing Labour's appeasement of extremist Muslim groups, the need for much greater investment in intelligence, the improvement of infrastructural resilience and the case for allowing intercept evidence. Protecting the public should be any government's top priority. Team Cameron need to demonstrate they understand that. * 4.25PM: "Commenting after Lord Stevens was appointed adviser on security to the Prime Minister, Shadow Home Secretary, David Davis, said: "We welcome this appointment. We hope it will lead to a more measured response to the security threats we face."" Lord Stevens continues as head of the Conservative Party UK Border Police Taskforce. ConservativeHome.com's June survey of readers' opinions is now live - click here to have your say. In addition to the regular questions we are also seeking your opinion on your pick of the likely candidates to be the next Tory Chairman. The questionnaire includes an option to continue with Francis Maude. "Constitutional reform" was penned on to Gordon Brown's grid for today but the breaking news that the Metropolitan Police has disabled a car bomb in Haymarket will change all of that. The new Prime Minister has just been on television promising vigilance and he will undoubtedly use this event to make it clear that he will continue the Blair-Blunkett-Reid approach to security. The Sun will certainly get behind any attempt to increase police powers to detain without trial for a longer period. One of the most important appointments that David Cameron will make next week in his expected reshuffle will be a replacement for Patrick Mercer. 11.20am: "One of the great delusions of our time is that once Blair, in the UK case, and Bush, in the American one, stepped down from office the terrorist threat would disappear. The news that a car bomb attack was foiled in London last night illustrates just how wrong this belief was." (James Forsyth on The Spectator blog). 'In comes Brown... income taxes' is the message on conservatives.com this morning and the graphic on the right (click it to enlarge it) is an encouragement to donate to the Conservative Party. Click here if you want to give. Another way you can help is to join the new Campaign Together email list. I signed up yesterday. Writing for The Telegraph this morning Iain Dale says that "the hot money" is on Caroline Spelman to replace Francis Maude as Tory Chairman. I have heard the same from two independent sources this week. Editor's comment: "I sincerely hope that the speculation about Caroline Spelman becoming the new Chairman is wrong. Caroline has many abilities but she would be the wrong choice for this job. The five people I spoke to at CCHQ yesterday evening greeted the prospect with undisguised horror. CCHQ needs someone who has the warmth to command loyalty and respect amongst staff at the Millbank HQ and to lift the grassroots when they are battle-weary. David Cameron needs a Chairman who can go on to the television and speak with authority and a little humour. He needs someone who has the tenacity to organise attacks on the Labour Party and, on appropriate occasions, to match Team Brown's ruthlessness. If the top three shadow cabinet members - Davis, Hague and Osborne - are to stay in place, Mr Cameron's choice of Chairman will be his most important decision. If Francis Maude is to move on, Chris Grayling would be a much wiser appointment. It would also show that Mr Cameron understands the sort of things that will rebuild his relationship with grassroots Conservatives." Also in The Telegraph there is speculation that Hugo Swire will be chopped for his role in the museums charging row and Oliver Letwin will go "because of accusations that the party has failed to come up with clear policies." Such a verdict is premmature. We will only know if the policy review has failed after the policy groups have reported. Oliver deserves time to finish the review and then it will be time to take stock. Sacking Hugo Swire would be a difficult decision for Mr Cameron. Both Old Etonians, they are close friends but advisers may see his removal from shadow cabinet as proof that the Conservative leader has sufficient ruthlessness. I am hearing that David Willetts may now survive the reshuffle. The party leader is making a big speech on education next week and David Willetts has been at the heart of preparations for that speech. How should Cameron respond to Brown? In the first of a series of exchanges between Tim Montgomerie, Editor of ConservativeHome, and Matthew d'Ancona, Editor of The Spectator, Tim suggests some first steps for Project Cameron in 'the Brown era'. I'm glad to be doing this exchange of thoughts with you again and many congratulations on the Coffee House blog. It's quickly become essential reading. Brown has had a good few days and it's beyond doubt that he should not be underestimated. I think David Cameron should expect some tricky opinion poll ratings in the next couple of weeks. If the party can hold its nerve over the coming period, however, I am hopeful that Project Cameron can still succeed. What should the Tories do next? First of all, I no longer think Mr Cameron should undertake a major reshuffle. I expect the 'big beasts' - Hague, Osborne and Davis - to keep their jobs. There is a case for some changes and for talent like Michael Gove to be promoted. The best course of action for David Cameron is to maximise the number of people who stay in position. Brown has undertaken a massive reshuffle in order to reinforce his change message but moving ministers and reorganising departments is distracting and not without perils. Having Tory spokesmen in command of their briefs - opposite Labour newbies could be useful. I'm hearing that the Tory reshuffle will be early next week. Have you heard the same? A is for authenticity: Labour is determined to portray Cameron as weak and superficial. Oliver Letwin's policy review process presents the party with a great opportunity to show that it, not Labour, has done the long-term thinking about Britain's deepest problems. In studying these reports David Cameron should not be afraid to embrace some tough recommendations. I'm sure he'll get them from Iain Duncan Smith on the family and John Gummer/ Zac Goldsmith on the environment. The worst position for the Conservative leader to end up in is to have said the family and the environment are important and then be afraid to adopt policies that will actually make a genuine difference. Authenticity in policy isn't enough. If David Cameron is going to insist that air travel isn't good for the planet he needs to stop taking so many domestic flights and start holidaying in Cornwall. He needs to walk the walk or at least take the train! B is for breadth: The need to keep the Conservative coalition together is being recognised a bit more. Many traditional Tory supporters - offended by the grammar schools row - will have been reassured by this week's clear leadership on the referendum on the EU Treaty but we need more of the same. Last night's remarks by David Cameron that he's committed to the 'And theory' and that crime, family values and Euroscepticism are as part of his mix as the NHS, greenery and tackling the causes of crime is very welcome. Again, the summer policy review should be used to prove that we are not a narrow party of the centre or of the right - but a broad party - embracing a broad coalition. C is for courtesy: This may seem an unimportant third point but I think it might be the most important one. A lot of traditional Tories feel quite bruised by the Cameron project. Telling supporters of grammar schools that they were "delusional" was incredibly unhelpful. I'm hearing rumblings from Ealing Southall that the local Association were hardly involved in the choice of the candidate. There are party candidates all over the country who hardly receive any information about selection processes. Quentin Davies (for whom I have zero sympathy) might - just might - not have defected if Team Cameron had spent time listening to his concerns. The Whips Office need to stop their hamfisted attempt to frustrate the work of the Cornerstone Group of Tory MPs. The circle around the leader needs to be more open and friendlier. 4.45pm: MATT HAS NOW RESPONDED ON THE COFFEE HOUSE BLOG. 5.08pm: Ian Austin and Angela Smith will be Brown's Parliamentary Private Secretaries. 4.57pm: As well as having a Minister for the North, ministers have been appointed to adopt regions. Caroline Flint and Liam Byrne are amongst those given roles. 3.34pm: Nick Brown is said to be Deputy Chief Whip and.... Minister for the North! 1.55pm: Andy Burnham is Chief Secretary to the Treasury, and Beverley "Visa" Hughes takes charge of Children and Youth Justice. 1.39pm: Mark Malloch Brown joins the FCO as a junior minister for the small matters of Africa, Asia and the United Nations. This is a telling appointment, because as Kofi Annan's former deputy at the UN he was a strong critic of the US. He spoke at the last Conservative conference about global poverty. 1.36pm: Tessa Jowell has lost her Cabinet status but retains responsibility for the Olympics. 1.30pm: CCHQ are on the ball - they've already released a dossier of the failings of most of the new Cabinet members. Click continue on this post to read it. 1.21pm: Ed Miliband will join his brother at Cabinet meetings, having responsibility for the Cabinet Office. 1.17pm: John Denham is back in the Government with Innovations, Universities and Skills. 1.11pm: Tory defector Shaun Woodward has been appointed Northern Ireland Secretary. 12.54am: Question marks remain over Yvette Cooper, Stephen Timms and Tessa Jowell. Housing, Northern Ireland, Europe and The Duchy of Lancaster are amongst the last positions up for grabs. 12.25am: More women appointees - Baroness Scotland is new Attorney General and Baroness Ashton is new Leader of the Lords. 12.20am: Des Browne stays on at Defence, and also takes on Scotland. Adam Boulton says 20 of 22 positions have changed hands. 12.10am: Baroness Williams talking to the BBC confirms that she hasn't been offered a ministerial position, instead being asked to take up some sort of unpaid, unwhipped, advisory role on WMD - subject to Menzies Campbell's approval. 11.54am: Hilary Benn gets the Environment portfolio. 11.52am: Confirmation of this morning's speculation that Geoff Hoon will get Chief Whip and Harriet Harman Leader of the House. Will there be a Deputy Prime Minister? 11.49am: Hazel Blears takes up Ruth Kelly's former role as Communities and Loval Government Secretary, another Blairite kept in. 11.44am: Ruth Kelly takes up Douglas Alexander's former role as Transport Secretary, the second woman confirmed so far. 11.36am: John Hutton is the new Trade and Industry Secretary. Rumours that the DTI will be scrapped look less likely now, although Sky are calling him Business and Enterprise Secretary. 11.33am: Jacqui Smith's big promotion to the Home Office has been confirmed by the BBC. I bore for Britain in recommending that the party embraces 'the politics of and'. The persistence may be paying off. At a dinner with Tory MPs last night the Conservative leader announced that he was a believer in 'the politics of and' rather than of 'or'! 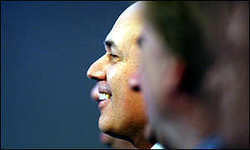 A party that would campaign for a referendum on the new European Treaty and would prioritise international development. The shadow cabinet minister who rang me this morning saw the move as an attempt to reassure Conservative right-wingers that the agenda of the party would be balanced. There will be two key 'moderniser messages' - the environment and the NHS - and two 'core vote messages' - crime and the family. Could a junior doctor be the next MP for Sedgefield? That is what Vicky Ford is wondering. A junior doctor campaigning against Labour's NHS record could win the seat Tony Blair is about to vacate but only if the other parties give him or her a free run. Intriguing thought. The need for a referendum on the new EU Treaty. Describing Tony Blair's agreement with other European leaders as a "sell-out" Mr Cameron says that the new EU foreign policy apparatus puts our relationship with America at risk. , He says that honouring the 2005 Labour promise to give the British people a referendum should be at the top of Mr Brown's in-tray. The NHS. "Labour have doubled spending on health - but does anyone think the health service is twice as good?" Mr Cameron calls for an immediate stop to A&E and maternity service cuts and urges Gordon Brown to embrace the Tory plan to stop political interference in day-to-day decisions. Schools. The Conservative leader calls for Conservative ideas on discipline and rigorous teaching methods to be adopted by the Government. Fighting crime. "Instead of wasting billions on an ID card scheme that won't work, the new Prime Minister should do the things that will make a real difference in protecting our security: community policing, more prison places, drug rehab services and a proper border police force." 11.24am: Jacqui Smith looks like she'll almost certainly be the first female Home Secretary. 11:17am: James Purnell, who has been a familiar face in the media recently, replaces Tessa Jowell as Culture, Media & Sport Secretary - a brief the former BBC man has been an adviser to Blair on. It's not clear if he will take on her Olympics brief as well. 10.50am: Peter Hain to get Work and Pensions so what will John Hutton get? 10.48am: Alan Johnson confirmed as the new Health Secretary. 10.37am: BBC reports John Hutton staying in the Cabinet, Harman to be Leader of the Commons. 10.07am: John Denham - opponent of Iraq war - may return as Home Secretary. 10.05am: BBC is reporting that Shirley Williams was offered a non-ministerial job to tackle nuclear proliferation. She is still considering whether or not to say 'yes'. Williams and Brown holiday together in America. 9.50am: Patten has described talk of him defecting as "drivel". Rifkind laughed off suggestions that he was defecting. Bercow is with Tory MPs in members tea room this morning. Let's stop the defection gossip! Slap on own wrist included. 9.45am: Tory reshuffle expected next Monday or Tuesday. 9.15am: Douglas Alexander to be International Development Secretary - he's going to find it difficult to coordinate Labour's General Election from Mozambique! It's a bit of a bad message to send about international development, too. Is Brown's commitment to Africa only worth a part-time Cabinet minister? Ed Balls will go to schools and skills because that is where the new PM thinks change is really necessary and the Chancellor's long-time key ally is the man to deliver it. Harman may be Leader of the House as well as Party Chair according to The Times' Sam Coates. 10pm: Growing speculation that Chris Patten may defect. 5.45pm: The Spectator blog is tipping Miliband to succeed Beckett. 5.25pm: It is confirmed that Blair will be quitting as Sedgefield's MP. That'll stretch the LibDems' by-election operation. 5.05pm: Tony Blair will be Middle East envoy for The Quartet. 4.40pm: Hewitt to stand down as Health Secretary. No big surprise but still very welcome. Brown to replace Benn with Bercow? There is a lot of blog-fuelled speculation about another defector to Camp Brown. A lot of it is focusing on John Bercow but he has denied that he intends to defect. Sam Coates of The Times (who has been blogging fascinating stuff all day) does suggest, however, that Gordon Brown might invite the Conservative MP to become Secretary of State for International Development. I disagree with John on many things but I greatly respect his commitment to development issues and human rights. My guess is that he would find it a difficult offer to resist. He might insist on staying a Tory MP and then David Cameron would face a difficult decision: Should he remove the whip from a member of a Labour Cabinet? All speculation at this stage but very interesting. He's already travelled from the Monday Club to being a very socially liberal moderniser who opposes tax cuts. His wife is a Labour supporter. Joining Brown's Cabinet would not be a very surprising next step in his journey. It would certainly be much more credible than Quentin Davies' defection (who is pictured here on the Labour benches today). "Gordon Brown has today tried to bury details of over £100,000 of political donations to his leadership campaign from a raft of rich businessmen and trade unions. Nearly half of the Board of Trustees of the Smith Institute - including the Chairman - have given cash donations to his leadership campaign. The controversial think tank is currently under investigation by the Charity Commission over its use by the Chancellor for political campaigning. A Labour peer who provoked a row over his tax status has doubled his donations to Gordon Brown and given a further £20,000 in cash through Caparo Industries, whose parent company is based in the British Virgin Islands. A fourth businessman, Labour peer Lord Simon, who was appointed by Gordon Brown to a Treasury panel on public services has now donated cash. This comes after three businessmen who were appointed by the Chancellor to Government posts were revealed last month as donors. “Gordon Brown has spent his entire leadership campaign promising to restore trust in politics. Now as soon as he’s become Prime Minister, he’s trying to burying bad news about embarrassing donations to his campaign. This sort of spinning doesn’t bode well for his time in Number 10”." Yet again it is Chris Grayling taking the lead on an issue like this. Chris was on this morning's Today programme re Quentin Davies. Alan Duncan did all of the media yesterday on the defection. Where was the Party Chairman? Absent from the grammar schools row, Francis Maude is absent again now. Extraordinary. In my live blog of today's historic PMQs I wrote this: "In what has to be one of the lowest points in public service broadcasting BBC2's Daily Politics coverage stops halfway through the Prime Minister's concluding remarks to cut to Wimbledon." "I find it incredible, whatever your view of Blair, that the BBC should cut historic coverage of a unique parliamentary affair to cover a second round match at Wimbledon." 4.30pm update: Just spoken to IDS. He was part of the Daily Politics panel when the coverage was cut. As he walked through the BBC offices at Millbank he said that there was a furious reaction with BBC staffers protesting with strings of four letter words! Iain himself said that it was an "appalling" decision. After a brief tribute from the Father of the House Tony Blair ends by making a speech paying tribute to the House of Commons. All sides of the Commons stand and applaud Tony Blair as he walks about. In what has to be one of the lowest points in public service broadcasting BBC2's Daily Politics coverage stops halfway through the Prime Minister's concluding remarks to cut to Wimbledon. I have now switched to Sky. 12.29pm: Rev Ian Paisley concludes by making a speech (The Speaker indulges him) - thanking him for the progress made in Northern Ireland. 12.26pm: David Blunkett thanks the Prime Minister for everything he has done. Tony Blair in return thanks the former Home Secretary for his work in tackling the causes of crime. 12.23pm: Another Winterton - Nicholas - tells him that the majority of Britons feel betrayed by him into the suffocating bureaucracy of the EU. If he and his successor really believe in trusting the people the Government should grant a referendum. Tony Blair disagrees in his answer and wishes 'Au revoir' to Mr Winterton. The House erupts into laughter. 12.22pm: LibDem Richard Younger-Ross asks about disestablishment. Tony Blair declines to answer. 12.21pm: PM makes joke about receiving his P45. 12.18pm: Ann Clywd thanks the Prime Minister for ridding the world of Saddam. 12.15pm: Ann Winterton asks a question about under-resourcing of armed forces. 12.14pm: Barbed question from Labour backbencher Jeremy Corbyn about the need for troop withdrawals from Iraq. 12.12pm: Ming asks about Iraq and Afghanistan and then pays tribute to Tony Blair for his courteous dealings with him at all times. 12.11pm: Tony Blair responds in kind - wishing David Cameron and his family well. Cameron gave Mr Blair no opportunity for Quentin Davies taunts. Mr Davies watched the exchanges from the Labour benches. 12.10pm: David Cameron paid tribute to Tony Blair for his public service and, in particular, his work in Northern Ireland and for the developing world. In a perfectly-pitched fifth question he wishes Tony Blair and his family well for the future. Well done, Mr Cameron. Statesmanlike. 12.07pm: Cameron's third question focused on Israel and Tony Blair's possible new role in the Middle East. Cameron then raises the captivity of BBC journalist Alan Johnston. Tony Blair repeats general principles of Middle East Peace Process. 12.05pm: David Cameron begins by asking about the flooding. Tony Blair replies by saying that flood defences are going to require a lot more investment in the years to come. 12.04pm: Tony Blair defines socialism as about being a philosophy for the many, not the few. 12.01pm: David Burrowes MP asks about Labour's NHS record. I wonder if the question came from a Facebooker? Noon: PMQs begins with tributes to the latest three dead in Iraq and then makes a bigger tribute to Britain's armed forces: "They are the bravest and the best." 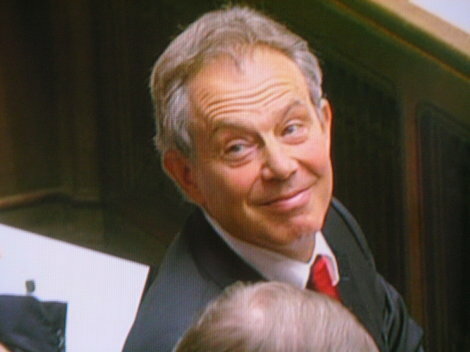 Blair wearing a red tie. Brown a blue tie. 11.58am: The Daily Politics is talking about the lucky brogues that a superstitious Prime Minister believes are crucial to his PMQs performances. 11.55am: Cherie Booth and the four children are in the gallery watching. Every Conservative with a LibDem MP can take comfort from the news that Ming's party are down to just 12% in a new YouGov survey for Sky News. The Conservatives are on 37% (the same percentage as in three consecutive polls) and Labour 1% behind on 36%. Only 14% of voters thought that being the heir to Blair was a good thing. Morning update: The most recent ratings for the Tories from Britain's five main pollsters are actually very stable: 37, 37, 37, 36, 36. The numbers for Labour (36, 32, 33, 39, 32) and the Liberal Democrats (12, 21, 17, 15, 18) are fluctuating quite markedly. “I heard this news from Quentin Davies with enormous surprise and disappointment. He has let down his constituents and his local party members very badly, and displayed great ill-judgement. David Cameron has launched the most substantial and heavyweight policy review that the Conservative Party has had for generations. As Quentin Davies well knows, that is due to report this summer. Under David Cameron’s leadership the Conservative Party will show that it alone can solve the deep-seated challenges facing Britain in the 21st century, so many of which have been directly caused by the control freakery and incompetence of Gordon Brown. I have no doubt that under David’s leadership the Party will go on to win the next election whenever it is called. William Hill are taking bets on another: "10/1 Labour MP to go Tory. After a Tory MP defected to Labour, William Hill offer 5/1 that another one will do so before the end of next year; and 10/1 that a Labour MP will cross the floor to join the Conservatives." Ben Brogan has talked to Davies (as has Nick Robinson) who told him he doesn't want to go to the Lords: "I've just had a word with Quentin Davies. He made up his mind at the weekend, and met with the Chancellor yesterday to announce his decision. He then showed Mr Brown the letter he planned to send to Mr Cameron, which was delivered to the Tory leader's office at the same time as it was released to the Press Association at 2.45 today. Mr Davies and Mr Cameron have not spoken." Mark Littler is pessimistic on the 18DS blog: "In a party already so divided, it is hard to imagine how, if at all, Cameron can recover from such a major setback, particularly bearing in mind the disastrous timing. The question on many peoples minds will be however, whether or not the new Labour MP will find his way into the cabinet, and if this defection is merely the tip of the iceberg – a taste of things yet to come." Martin Hill, Conservative leader of Lincolnshire County Council, told the BBC: "I think it's a slap in the face for all of those people who supported and went round for him. I feel very strongly, I don't approve of politicians who stand under one flag and then change to another flag for their own convenience. It is an act of treachery and betrayal, frankly." Quoted in the same BBC piece Lord Tebbit is on good form: "This defection will raise the average standard of members on the Conservative side and lower it on the Labour side", David Davis said he was "extremely surprised" and Nicolas Winterton wished him "good riddance". Facebook has a new group created by ex-CCHQ staffer Laura Clark entitled: "When MPs defect there should be a by-election"
Nigel Evans MP on Facebook: "Quentin Davies is doing the Temple Morris Shuffle to the Lords....pathetic......he should resign today and let the people of his seat decide which Party they want representing them in Westminster. His letter is pure poison set to deliver the worst damage to Cameron, whilst his timing is pure choreography timed to deliver the best lift to Brown." Alastair Burt MP on this post: "As a long time friend of Quentin DaviesI cannot tell you how personally betrayed I feel. He has no idea of what he has done. The weasel words do him no credit. We all have to compromise at times to work with a team, and reap the benefits of that teams hard work on our behalf, from those who work for us locally, with none of the pay and perks of an MP, to the colleagues who stand shoulder to shoulder with us. I rarely have a harsh word for anyone. But Quentin? Don't even bother to call or come near your former colleagues. Contempt does not begin to cover it." Thank you for your letter. Your decision does not come as a surprise to me. The Conservative Party has changed, as you say. We need to do more to protect the environment and tackle climate change. That will mean taking tough measures on carbon emissions. And it does mean looking at ways to encourage greater use of alternative sources of energy. Of course, I will also continue to stand up for Britain’s interests in Europe, and work to give the British people the referendum they were promised. People see that we are now focusing on what matters to them. That is why so many people are supporting us once again – as shown in May, when we won over 900 Council seats. I am sorry that you feel unable to be part of today’s Conservative Party, and join us in campaigning on what matters to people – for example, against the NHS cuts or for a better deal for pensioners. The big dividing line in British politics is between Labour’s approach of top down State control and the Conservative vision of pushing power outwards and downwards from central government, trusting people and sharing responsibility with them. You have made your choice and the British people will make theirs. Thank you for your support in the past. We will watch your future career with interest." When I recommended that we all fasten our seatbelts last week I expected many difficult moments during the Brown honeymoon but not today's defection of Quentin Davies to Labour. I knew he was unhappy with Project Cameron. He has felt shabbily treated by the leadership. A lifelong Europhile he wrote for ConservativeHome only two weeks ago - disagreeing with the party's alleged politicking on Iraq. I bumped into him during the grammar schools row and he told me that he was unhappy with the leadership's line. But he was in favour of grammar schools! Why is he joining a party that hates selection? Mr Davies has opposed ID cards and the Government's anti-terror measures. He has opposed the ban on foxhunting. 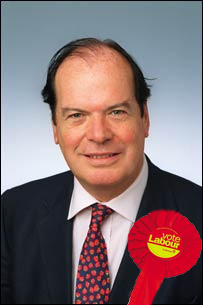 He opposed Labour on tuition fees. He opposes state funding of political parties. Mr Davies cannot easily accuse David Cameron of having no bedrock and then defect to a party with a worldview that stands in contradiction to his own twenty year parliamentary record. Labour are clever in the way they spun Mr Davies' defection. 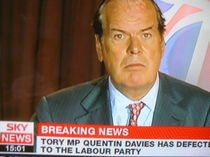 The subheadline on the BBC website is: Tory MP Quentin Davies defects to Labour, saying David Cameron does not "stand for anything". The long letter he sent to Mr Cameron mentioned a number of areas of difference - including over nuclear power. But at the heart of his defection is Europe and the EPP row. CCHQ will now be frightened that other Europhile MPs and MEPs, in particular, might defect if the party campaigns strongly against the draft Treaty. Mr Cameron must not retreat from his Euroscepticism. The party must not be held to ransom by a small number of MPs who are out of touch with the rest of the country. Cameron must not look like he can be bullied into changing his position. Labour are already determined to present him as weak. In his letter he makes a big deal about Mr Cameron supposedly breaking his pledge on the EPP. What about Mr Davies' pledge to the voters of Grantham and Stamford? They thought they were electing a loyal Tory. I feel sorry for his activists in Lincolnshire. I spoke at their political supper club at the start of the year. They were loyal to him despite his enthusiasm for Europe. He has betrayed that loyalty. At least they'll soon be able to choose a new candidate who will be closer to their views. I wonder if Mr Davies will be on Mr Brown's frontbench by the end of the week? In fact I wonder if this defection is rooted in Mr Brown making an Ashdown-style approach to Mr Davies to serve in his Government? And all of us? We must not over-react. A few weeks ago the newspapers thought that Brown was unlikely to save Labour. They'll all be singing his praises in the next few days but it probably won't last. There does need to be more breadth and depth to Project Cameron but it will be hard to say that there is nothing to it after this summer's schedule of policy announcements. I am also confident that the new communications guru, Andy Coulson, will help the party to develop stronger messages for our core voters and strivers. Labour's failure on tax, crime, immigration and fighting poverty will also become clearer and clearer. Keep those belts fastened everyone.